Counseling clients on the protection of their family, property and person in case of death or incapacity is another service The Dill Firm provides. Our members have a wealth of experience in guiding clients in the creation of testaments, trusts and powers of attorney; in planning for federal estate tax issues; and in performance of simple as well as complex succession work. 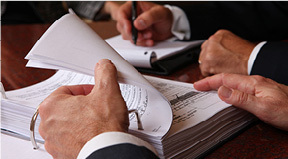 We know that the most important service we offer to these clients is our expertise in guiding them through the many rules and intricacies of this area of the law. In this area of the law, rules and intricacies abound. Don’t worry, we’ll guide you through them.